Ali Cross, the USA Today Bestselling author of the Desolation Series, has always had a flare for the dramatic. As a child she organized backyard performances of classic plays and musicals and hosted tea parties for invisible friends and pets dressed in doll clothes. Her teens were a haze of boys, drama (of the real life variety), and music. So it really didn’t come as a surprise to anyone that the girl her family called a dreamer, ended up writing drama—with angels, demons, and other supernatural creatures thrown in for fun. After university, Ali traveled for love from the Great White North to the Utah desert and now entertains her devoted husband, almost-grown twin sons and adorable yorkies with her wacky song renditions and random movie li Ali Cross, the USA Today Bestselling author of the Desolation Series, has always had a flare for the dramatic. As a child she organized backyard performances of classic plays and musicals and hosted tea parties for invisible friends and pets dressed in doll clothes. Her teens were a haze of boys, drama (of the real life variety), and music. So it really didn’t come as a surprise to anyone that the girl her family called a dreamer, ended up writing drama—with angels, demons, and other supernatural creatures thrown in for fun. After university, Ali traveled for love from the Great White North to the Utah desert and now entertains her devoted husband, almost-grown twin sons and adorable yorkies with her wacky song renditions and random movie lines. As the only female in the house she considers this her right and her duty. 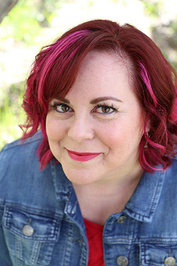 Never one to conform to expectations, Ali enjoys writing in multiple genres: Ali Cross books for young adult paranormal romance; Ali Banks Cross books for middle grade adventures; and Ali M. Cross for inspirational romance. She promises to entertain you no matter which of her books you pick up. Sign up for Ali's Newsletter! To ask Ali Cross questions, please sign up. Fun, Feisty and…Fangs? Check Out My Latest Book! We’d love your help. Let us know what’s wrong with this preview of Sea of Flames by Wendy Knight. We’d love your help. Let us know what’s wrong with this preview of Deadly Sweethearts by Ali Cross. We’d love your help. Let us know what’s wrong with this preview of Neighbors with a Necromancer by Carina Cook. Hi Ali, thanks for connecting. Hello Ali, it is a pleasure to meet you.